After a 2-5 non-conference record against a rigorous schedule, the Dukes came into Atlantic 10 play ready to put a tally in the win column and start their conference campaign on the right track. Duquesne women’s lacrosse put on quite the show for the fans in attendance at Arthur J. Rooney Field as they routed the Bonnies of St. Bonaventure University by a staggering 25-8 score. The 25 goals scored were the most scored all-time in a single game by the Dukes surpassing their previous high of 22. The Dukes put on a scoring clinic, but the most encouraging thing for head coach Mike Scerbo has to be the balance that his offense displayed with 12 different players registering a point. The Red & Blue have been led all season by their sophomore attacker and leading point getter, Jill Vacanti. Vacanti entered the game with 15 goals, two assists and 17 points. Her stats heading into the next matchup against UMASS will be an impressive 21 goals, three assists and 24 points— yes Vacanti tallied six goals and an assist against the Bonnies. Keeping pace with her was junior midfielder Kaelin Shaw who also recorded six goals of her own in the 25 goal effort. She now has 15 goals and 17 points on the season. Also scoring for Duquesne was Tess Drotar (three), Sarah Dawley (two), Sarah Kollhoff (two), Macy Marafioti (two), Haley Matthai (one), Kaitlyn DeHaven (one), Courtney Battles (one) and Megan Buettner (one). Duquesne may not be able to count on having 10 different scorers every game, but what they can count on is a balanced team effort. If there are this many players with scoring potential it becomes difficult for other teams to zone in on just any one or two players such as Vacanti and Shaw. Additionally if one of their top players is struggling, the Dukes should have plenty of other options to pick up the slack. 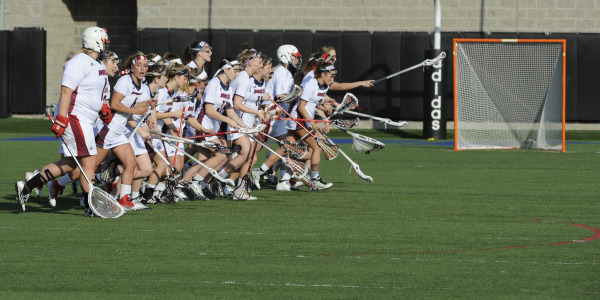 The next team that will have to try to slow down this Duquesne attack is the UMASS minutewomen on Sunday April 3. The Minutewomen are the gold standard in the Atlantic 10 winning the last seven straight Atlantic 10 Tournament titles. Duquesne has come close a few times, but it’s going to take a total team effort to successfully close the gap. Scerbo discussed how developing a sense of balance this season would allow his team to be on the attack more and have the ability to keep up with teams like UMASS that can put up 16 or 17 goals on any given day. After just one game into Atlantic 10 play it already seems as if this Duquesne team has developed that team dynamic that Scerbo was hoping for. The even more promising thing for Scerbo is that of those 10 goal scorers, not a single one of them is a senior. This team has time in the remainder of 2016 campaign as well as next season to develop that necessary team chemistry and become a dominant team in the Atlantic 10 Conference. This team has a valuable combination of veteran leadership and young talent that could prove to be lethal enough to dethrone UMASS and win an Atlantic 10 Championship of their own. A 17-goal winning margin will surely give the Dukes a tremendous confidence boost as they get set to play UMASS and see exactly how they stack up with the top talent in the conference.